This public article was written by Admin Sheep, and last updated on 2 Jan 2016, 02:47. Menu 1. Step 1: Background layer 2. Step 2: Water layer 3. Step 3: Highways #1 4. Step 4: Highways #2 5. 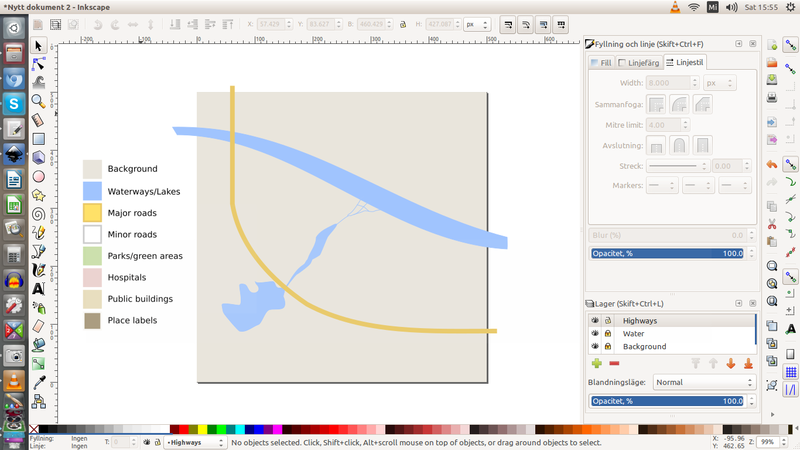 Step 5: Mapping minor roads 6. Step 6: Minor roads #1 7. Step 7: Minor roads #2 8. Step 8: Parks and green areas 9. Step 9: Other areas 10. Step 10: Other areas 11. 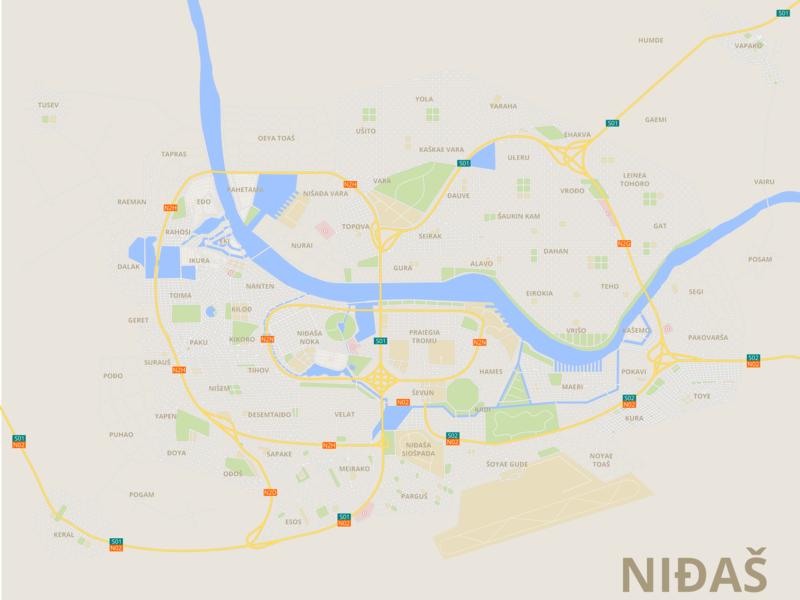 Step 11: Final product This tutorial covers how to make maps in the style of Google Maps, such as this beautiful map (if I do say so myself) of Nithash, Nithalosia. 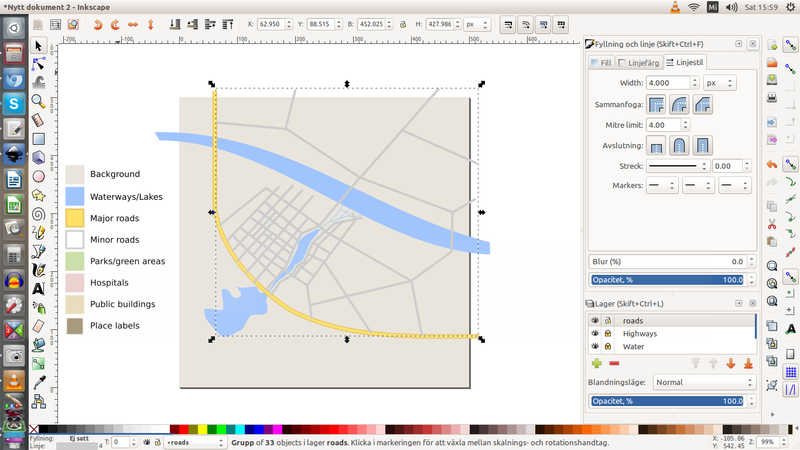 This tutorial uses the vector editing software Inkscape which is freely available across Windows, Linux, and Mac. For this tutorial, you will also need our palette image we've prepared for you. This will make it easier to get the right colours. Of course, you're able to use all your own colours, but these have been helpfully collated for you from Google Maps itself. 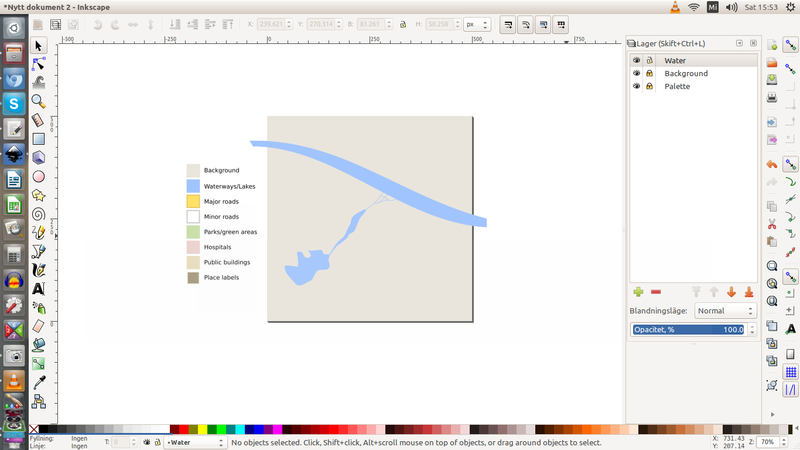 To start, open Inkscape and create your canvas ready to go. 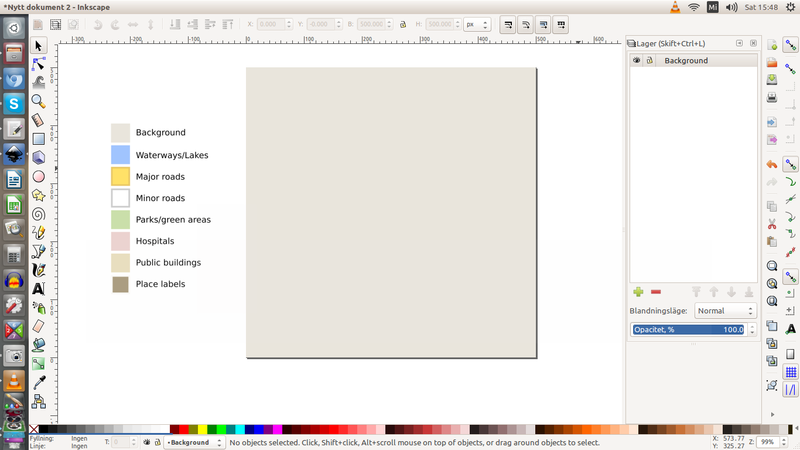 You will want to import the palette image and put it on a locked layer since you won't need to edit it at all. Keep the image outside the canvas area too. 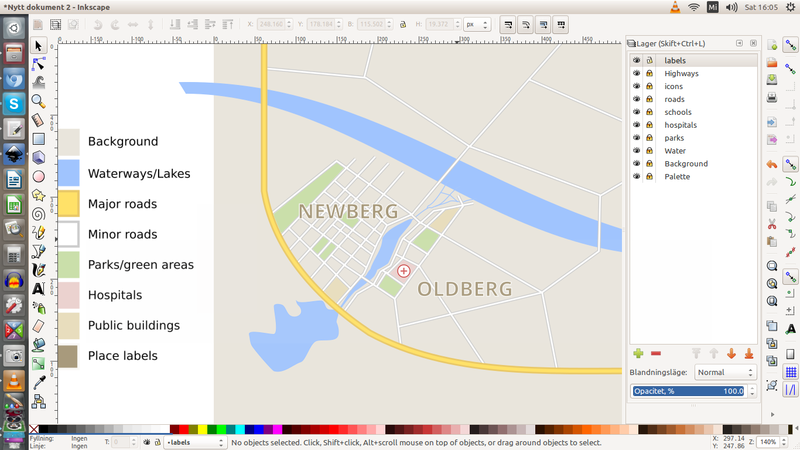 This is a super easy step to create the background colour for the map. 4. Colour it the 'background' colour from the palette. The next step is to draw in the water layer. This is the layer that has all your rivers, lakes, streams, coasts etc in them. This should be one of the first things you consider since you'll need to know where to build your city around it. When you draw these in, it doesn't matter if they go over the end of the canvas (it's actually better that they do) since when you export the image, you can set it to export just the canvas. In order to create the highways with the outlines, we need two steps. The first part is to create the 'outline' part. 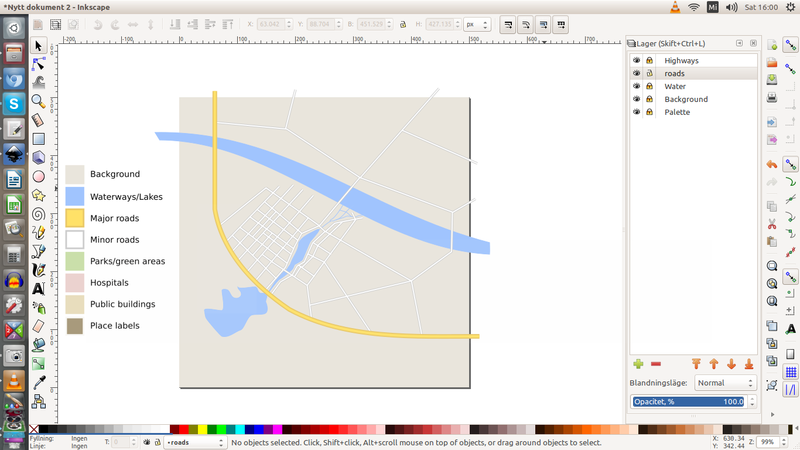 On a new layer (above water and background layers), draw in your highways. Take care of where one highway meets another, since there should be ramps from one to another. This creates a realistic, but spaghetti-esque junction of highways. Now you need to create the 'inner' part of the highways. This step easily takes the longest. In this step you want to draw in all your minor roads in your town/city. For the moment leave these as the default lines. 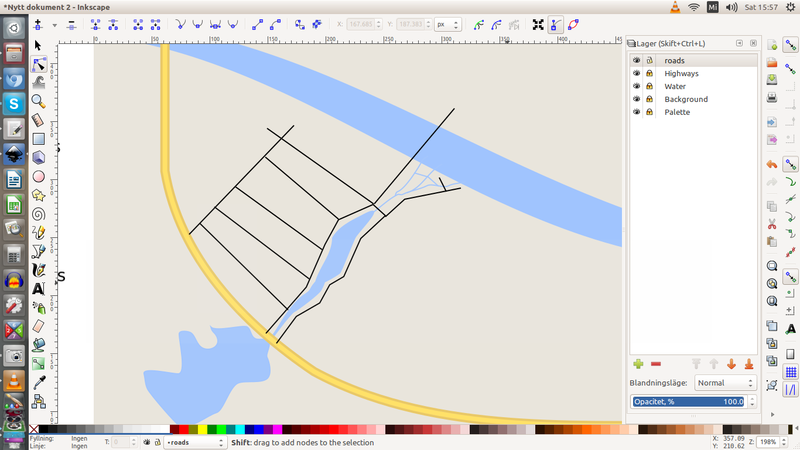 You want to put these lines into a new layer, and preferably below the highways layer, but above the roads and background. Take into consideration the landscape as to where your roads will go, and remember to leave larger spaces for things like parks, schools, hospitals, shopping complexes, train lines (if you're going to add these in), stations, airports, etc. Once you're happy with the roads, you can move onto the next step. We use a similar technique to the highways here to create the border effect. This time though, we'll use the 'Minor roads' square on the palette. 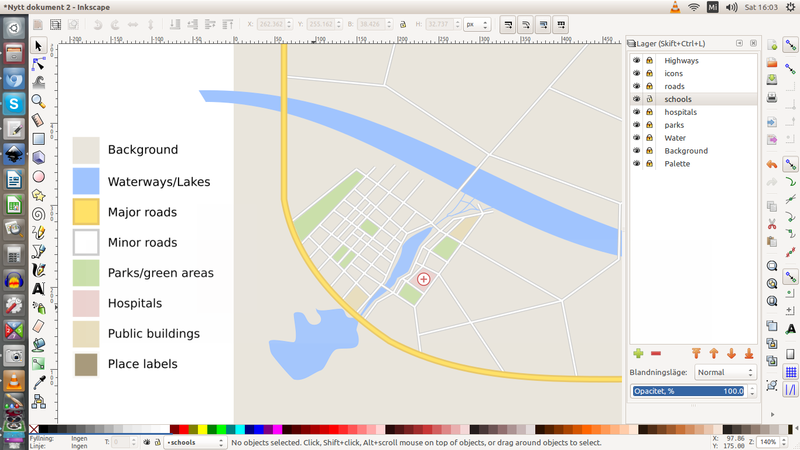 On a new layer (below all roads, but above background colour and water), you will fill in areas for your green spaces. The easiest way to do this is to fill in gaps between roads (because most of your parks should be surrounded by roads right?). Using the fill tool, simply fill in the areas you want to have as green areas. 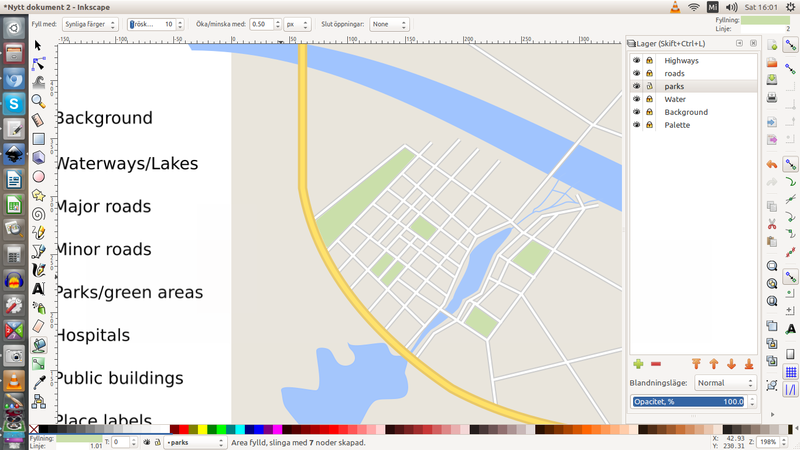 If you fill between roads, it's a good idea to use the increase fill option (set to about 0.5px) to make sure that the fill fills the whole area (sometimes in Inkscape it doesn't). Other areas you can just draw the shape you want and fill it in. Make sure there are roads to the parks/green areas though because they should be accessible. Just like the parks and green areas, you can use the other colour palettes for other areas like hospitals, and other government/public buildings (schools, universities, arenas, theatres, etc). 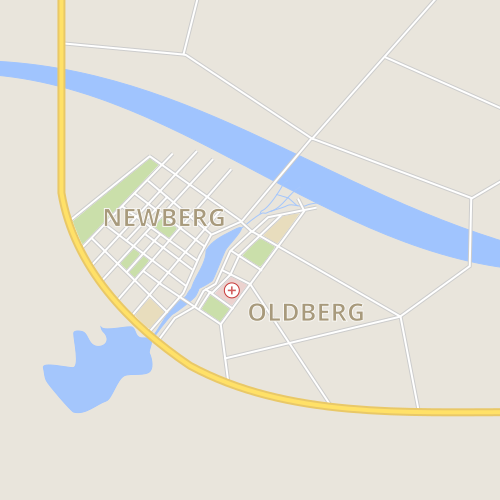 You can use icons like on Google maps (I've used one for hospitals in my demonstration). These should go on a separate layer above all the roads/highways and other colours. You can create whatever symbols you like. My hospital symbol was inspired by Google Maps'. You can also add labels for schools and parks etc, but I have chosen not to. Last but not least, is the labels for your suburbs and cities and such. 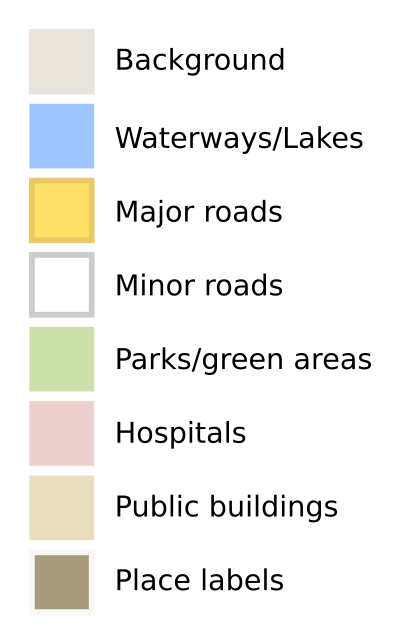 Note that on the palette there are two colours for this, the inner and border colour. You can set the border colour of text using Shift+Click on the colour you want. I recommend using a heavy/bold font for your label names as that way they're easier to read. Try and place them in areas that are not heavy on other labels/symbols so that it doesn't cover them. Once you're finished making your other edits (you might want to add other things, it's up to you), you can export your image. In Inkscape you can do this through the menu or with Ctrl+Shift+E.